The story: Cam Jansen is invited to a birthday party. At the party, the kids are invited to guess how many dinosaurs are in a jar. The one whose guess is closest gets a prize. When one of the guests comes up with the exact number, Cam is suspicious. Using math skills and her photographic memory, Cam is able to crack the case. Mama opines: I like Cam Jansen. She is smart and her adventures seem much more accessible to young readers than traveling in a magic tree house or fighting an intergalactic battle. One of the greatest things about this character is that she isn't limited to one reading level. 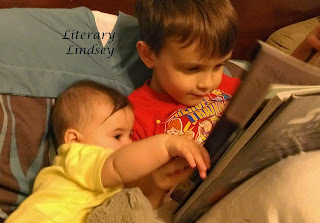 Her stories begin with young reader books, like this one, which are aimed at beginning readers. The books get longer and some of her more recent books are chapter books that are appropriate for readers in 2nd - 4th grade. It's nice to have a heroine who can grow along with your reader. Thoughts from David: Well, here we go - another Cam Jansen. You know, we've been reading a lot of these this year. Well, readers, I've got to say something about this Cam Jansen. 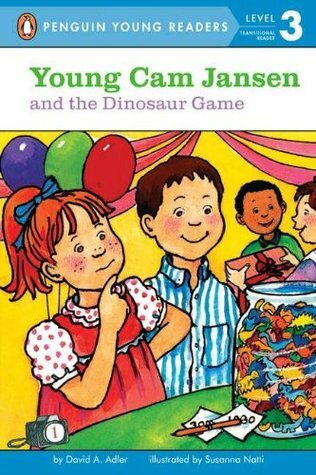 The thing about this Cam Jansen is that I don't usually read Young Cam Jansen books. You know, this isn't my book. It's from my school library. Hey, all readers, here's a joke for you. What do you call an egg with no egg in it?An eggless eggster! Ok, ok, ok. Let's just get to the things I like. This book is one of a kind because Cam Jansen books are usually mysteries. I like it because there is a dinosaur game in it. Nice review, Lindsey and David! I love the way an Agatha Christie style mystery has been introduced in a dinosaur game. I would love to read this sometime. This series is a great one!